This post is the last of an occasional series documenting my entry into project-based learning. This semester, my students participated in 20Time, a 12-week experience where they chose a worthwhile project to complete (somewhat) on their own using 20 percent of our class time. You can read more about the path that led to this project here. Now that the year is done and I’ve enjoyed some hammock time, it’s time to reflect on this 20Time adventure. When the student speeches were finished in late May, I was 90 percent certain I wanted to give this pilot project permanent status in the curriculum. After talking candidly with different groups of students about their experiences in our last few weeks of school, I’m now 100 percent certain that this project will be a spring semester fixture in my classroom. 1. 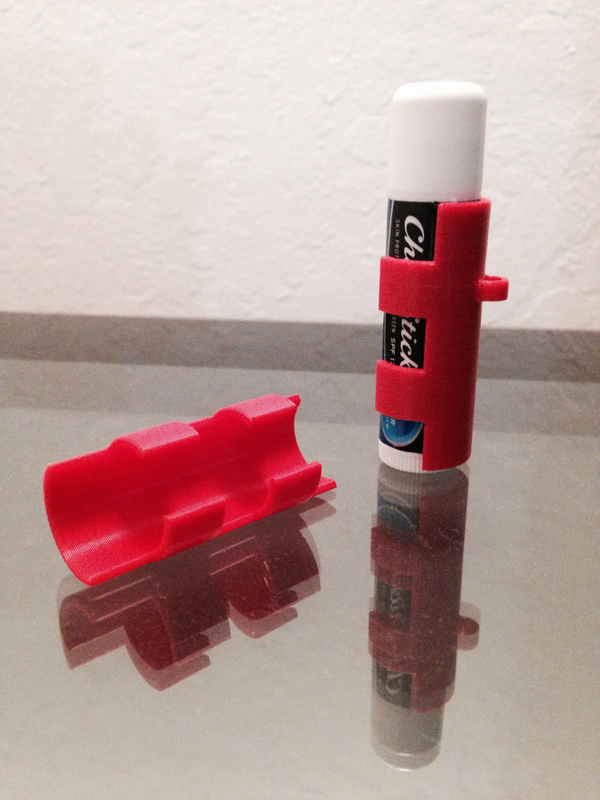 Balm Buddy is the creation of T.T., a student who sketched, computer-drafted, and ultimately built 32 pocket-sized lip balm keychain holders using our engineering department’s 3D printer. T.T. used online software to draft the model and then sweet-talked our engineering teacher into letting him use the lab after school. A few sheets of plastic later and T.T. had built a working prototype of an invention that could be the Next Big Thing in keyring accessories. (The red is nice, but imagine it as a monkey or koala – cute, right?) T.T. also wrote a business plan and researched patent laws as part of his project. 3. Finally, B.B. dazzled the class with a built-from-scratch RC truck that can race up to 40 mph. Once he popped off the shell, he became a surgeon, deftly explaining the inner spaghetti bowl of wires and connectors. He also designed a single-sheet set of directions in “kid talk,” so middle-schoolers could follow his steps. Finally, he closed his speech with a Hollywood-style video of his truck rounding corners and completing jumps in scenes would rival the latest summer blockbuster. Now, not all of the projects were this successful. In weeks 4 and 5, a handful of my kids (thinking back, probably five or six) approached me with requests to switch projects; I refused in the kindest way, reminding them that their struggles were the whole point of this project. Instead of bailing, we brainstormed. Some were able to get back on track, others weren’t. In every case, lessons were learned. When projects failed, it was either because the original plan was too grand in scope (solution: scale back and complete one baby step toward the larger goal) or the student wasn’t truly passionate about the project. Several students said they weren’t able to spend any out-of-class time on their projects (which is fine; homework was never a requirement), but I would argue that a student who couldn’t find any extra time in his life to work on the project wasn’t really passionate enough about the selection to begin with. 1. Content creation is hard. My students are consumers, zoning out on YouTube channels, binging on Netflix, trolling through Instagram/Snapchat/Whatnot. Actually creating that content is a whole different thing and many of my students now have a deep appreciation of what it takes to build a blog following or YouTube subscriber list. 2. Distraction-free environments are rare and necessary. Many students said they allowed themselves to be pulled off course by phone notifications or other interruptions, especially when facing the harder parts of their projects. The successful 20Timers learned to turn their phones off or leave them in another room. If my students had known that other people were facing similar highs and lows, they told me it would’ve been a bit easier to ride those first choppy waves to get to the calmer waters of project creation. 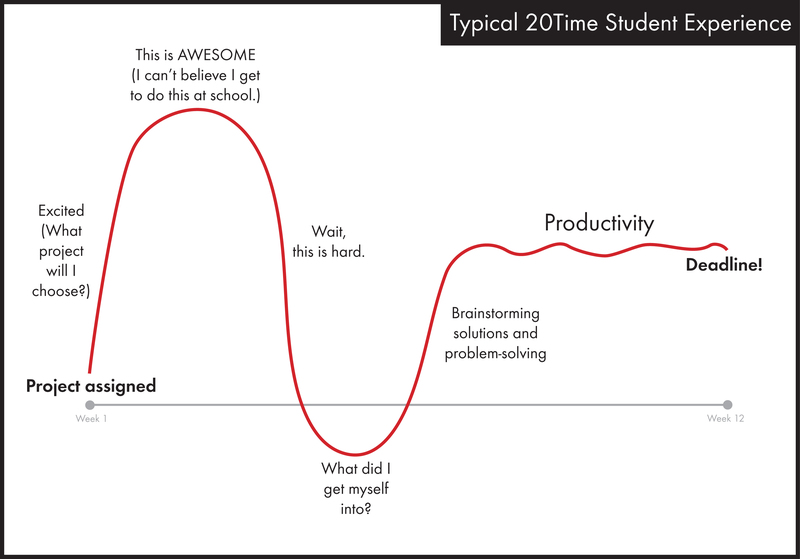 We didn’t collectively discover this curve, though, until we were midway through students’ reflection speeches. 2. They will surprise me. Some of my highest academic achievers painfully struggled (which I sort of expected from those Excellent Sheep), while some of the kids with the lowest academic scores just killed it (which I didn’t expect at all). In every class, I had at least one moment of wonder when a lower-achieving kid presented a marvel of a project. The takeaway? I need to build more authentic hands-on learning opportunities throughout my entire year, not just for 20Time. 1. Add better accountability. I tried a mid-point check-in with my juniors, but it took me more than three class periods to conference with everyone. Unfortunately, that’s time in my calendar I just don’t have, especially since I’ve already carved out three days for Guppy Tank presentations and 12 days for work sessions. So, taking a student’s suggestion (thanks, Mackenzie! ), I’m going to assign Accountability Teams. At the 4-week and 8-week marks, those teams of four students will be given class time to meet and show teammates what they’ve been working on, what they’ve accomplished so far, and what they plan to do with the remaining time. My hope is that seeing what other students are creating will motivate those who are losing steam and the teams can help brainstorm pathways around roadblocks. And, yes, I’m going to assign the teams (at least one high-, medium-, and low-performer per group) rather than allow free-choice groups. 2. Add a Support Our Bloggers day in the computer lab. Many students built blogs or channels, but it’s disheartening to labor over a post only to have no audience. A “like” or encouraging comment goes a long way in making a blogger feel like he isn’t talking to a wall. Next year, I’ll work in a surprise lab day about halfway through the project, posting a list of blogs/vlogs on my class website and an assignment to read/view and comment on at least three classmates’ entries. I think this will be a good shot of motivation for that large group of content creators. 3. Celebrate with some sort of end-of-the-project gallery. We were able to glimpse the projects as screenshots during the students’ speeches, but everyone really wanted to see/touch the tangible items that were created and/or explore the digital channels/pages. Maybe this will look like a science fair or tradeshow with booths in the multipurpose room? Not sure yet, but I know I want to have some sort of wrap-it-up experience. Why do we go to school? It’s not (surprise!) to learn specific poetry terms or mathematical formulas. We’re at school learning how to learn – and we should want that learning to continue all our lives. This project took students’ nuts-and-bolts skills and provided an opportunity to use those tools in a meaningful way. It’s entirely possible that the seeds planted in this spring semester will grow into future passions and, hopefully, careers for my students. We must use the power of our classrooms to foster this kind of growth. The kids (mostly) loved 20Time, parents unanimously loved it (lots of affirmations and not one complaint email/call – when does that happen? 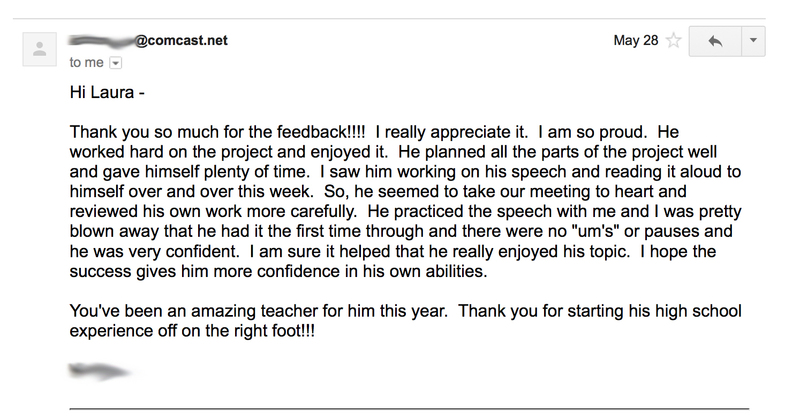 ), and I definitely loved it because I learned so much about my students and about myself. That’s what I call a win. I wonder if I could get my admin to let me give this a chance next year…any pointers for my presentation? I continue to be amazed and inspired by everything that you do. Even though I teach at the middle school level, I am a HUGE fan of your TPT materials. Thank you for allowing me to use so many of your materials as I navigated this 20Time journey with my GATE 8 Language Arts classes. I, too, was blown away by what these amazing young men and women could do and the incredible passion with which they worked. I am attaching a link to the video of what my students decided to tackle (that is, if you find yourself with 6 minutes of free time). I hope that you are able to enjoy a restful and relaxing summer. I’m sure the ukulele will come in handy! My pleasure! 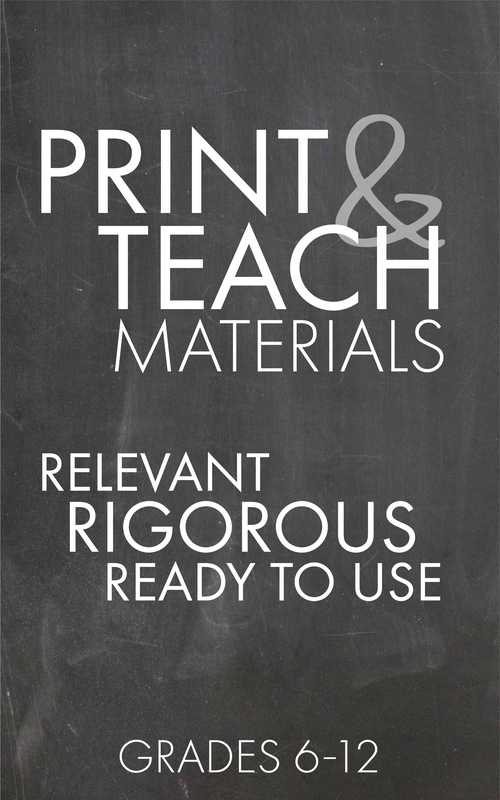 Glad the materials are finding a place in your classroom. Your students are adorable and I love the wide variety of projects they pursued. I gotta tell ya, 20Time has me excited for our country’s future. Imagine if every campus had a way to harness all of this youthful creative energy…we could move mountains…and build satellites…and cure diseases…and end global hunger. Dang! We might be onto something BIG here. Let’s both enjoy this well-deserved summer season and juice those batteries for the fall. It’ll be here in a wink! My students recently finished their 20 Time Projects as well. I agree with you, I will 100% incorporate it into my curriculum again. I loved the feedback from the students and parents. I found the same things you mentioned above about the achievers, accountability, and passion/productivity. The students finished the project with a presentation in the auditorium. That may have been the best part! The top projects/presenters were voted by their peers to present again in front of a larger audience, almost like a TED Talk. It was a great close to the projects. I definitely have things to fine tune for my projects next year but I’m looking forward to what the next group will come up with. Your blogs were a huge help for my jumping point into the project. Thank you! Wonderful, Lisa! It’s so great knowing that our experiences aligned – and I love your TED Talk component. We used TED as a model for our in-class speeches, but you really took it to the next level. Awesome! What a great way to encourage creativity and productivity. I imagine that this will be life-changing for some of those students who aren’t used to classroom success. Thank you for sharing! This is awesome! I have been searching for PBL activities for my English class for years. I am going to explore this with my “encore” class (English 1 repeaters) this year. Thanks for sharing. I’m excited to get started with this concept with my sixth grade GATE class. I mentioned to them today that we will be starting something that will give them autonomy over their learning. I am trying to build suspense. I think it will be great. Thank you for sharing all your resources, what a time saver. You are an inspiration! Oh, I love to build anticipation with them, Lori. My freshmen have already started asking about 20Time because my sophomores, apparently, don’t have anything else better to talk about than last year’s English class. 😉 Have fun with your 6th graders! When carving out time for this did you eliminate/reduce SSR? Did you allow any of your students to work in teams or pairs? Great questions! I actually don’t provide any of the materials. I have three Chromebooks in my room that students can borrow, but I tell them that if they want to have a tech-dependent project they need to bring their own laptops/tablets. There are lots of writing-based projects they could choose if they don’t have access to a device, too. To make time, I do have to carve away a few of the SSR sessions, but mostly I boiled down The Odyssey, which has 24 books/chapters. Now, we study only 12 chapters and I just summarize any important info. from the parts we skip. It hurt to make those cuts at first, but I’m so glad I did because the passion projects had a much larger impact on many of my students than an extra scoop of Homer would have. Finally, I didn’t allow any students to work in teams and I’m going to continue that policy. Two classmates won’t have the exact same passion/interest, so one would be compromising. Also, I like the accountability that the solo project creates and I’m required by my district to have each student give an individual speech (no teams allowed), so I use the TED Talk-style 20Time wrap-up speech to fulfill that requirement. Last year, it worked beautifully and the speeches were some of the most interesting ones I’ve seen in my career. Hope this helps clarify how I run the show. Feel free to let me if other questions/concerns arise. Good luck! Thank you for sharing your PBL journey! My school is a PBL magnet and we dedicate at least one day a quarter to completing a school-wide PBL. Most of the projects seem meaningful at first, but there were still some kinks (buy-in, accountability, etc.). Other than the school-wide projects, I’ve never ventured into doing a true PBL in my classroom. This inspires me. Thanks! Thank you so much for your detailed posts and free packet! I proposed this to my staff and our entire high school is going to do 20Time during our intervention period! I present your prezi tomorrow to the students and we’ll start in our groups in a week. I see in previous comments you provided no materials – was that a challenge if a student had an idea but no means to get the materials? Also, if a student chose a wood-building project or sewing project, for example, did they bring the materials and work in your classroom? Or did you ask to see if they could go to the shop or FACE classroom? I know we will have kinks but our staff is so excited to do such a fun and inspiring project! Thank you, as always, for making us all better educators!!!! Terrific, Chantel! A school-wide 20Time experience? Now that just blows my mind! Okay, so my decision not to supply any of the project materials (the “stuff”) needed by individual kids was purely a practical one. I’m not given a classroom budget, and I didn’t have the means to buy all of the various pieces and parts that kids might want to use. I was able to cobble together six Chromebooks from teacher friends in the hallway who were willing to share their tech, but one of the basic rules for the project was “if you’re going to need it, you’re going to have to supply it.” This included computer access because I couldn’t guarantee that every kid who needed a Chromebook would get one. I teach in an affluent area, so many of the kids were able to bring their tech and supply their own hard materials. For kids who didn’t have resources, I encouraged them to choose a project that didn’t need a lot of stuff, such as turning a well-known short story into a screenplay, writing and illustrating an anthology of original poetry, storyboarding a graphic novel, etc. Also, kids were required to plan out their in-class work session each week (about 45 min.) so that they had a piece of their project they could do in class. If a kid was welding a sculpture and making a YouTube video documenting the process, he couldn’t very well weld in my classroom. Instead, work session time in that case might be editing video clips, finding legally available background music, and/or maybe researching other famous welding artists and techniques. My students stayed put in my classroom during the work sessions, though I would occasionally let a student or two work outside if they were at a particularly noisy or messy part of their project. I didn’t let students go work in other teachers’ classrooms because those folks had their own classes to run, though the timing of your full-school project should allow for much more flexibility. I would worry that unsupervised kids will waste their work session if they’re all running around to other spots, though, so that’ll be something to monitor. Finally, I can’t help but wonder if ALL of your teachers are going to each complete their own 20Time project as well? A big piece of my success, I think, is that fact that I was working on a project right alongside my students. The modeling of my successes and candid discussions of my failures was huge in terms of motivating my kids to stay focused. *Fingers crossed* that your staff is really on board with this important piece. This is great! Thank you so much for responding right away and during this busy time of your own back-to-school madness! I truly appreciate it! Take care and we’ll let you know how it goes! I have ALWAYS loved your materials – and stumbled upon your 20Time this afternoon. After several hours of reading and scheming, I am SOOOOO excited to implement my own version of this in my classroom this year. Thank you for your time AND willingness to share with those of us who have the ideas, but not the nuts and bolts!! I appreciate your generosity to share those nuts and bolts with us!! I have been dragging my feet about getting ready for this school year, and now I am pumped!! Thank you!! Do you have any videos of the student speeches you could share? Sorry, Samantha, I don’t. We haven’t ever filmed these. An interesting question, JoAnn… My kids choose their own projects (there’s always a w-i-d-e variety) and not all of the tasks require research in order to be completed, especially the creative writing and artistic ones. I know some teachers require a weekly blog entry with their 20% projects that tracks each student’s progress, but that piece feels too cumbersome to me. Our 20Time works because students are authentically interested in the work they are doing. A required research paper would definitely quell the fire for some (a lot?) of my kids. I am a technology teacher for 3-8 and I am considering doing a version of the 20time project for a quarter class. Do you think this would be too much time to devote to it. I worry about kids getting bored with it not being just once a week and something to look forward to. However, I love the idea and would love to figure out a way to do a version of this. Any thoughts or suggestions? Thanks in advance. Thanks for checking in with me, Emily. I definitely think the once-a-week work session is part of the magic because the 20Time projects become something we all look forward to instead of feeling like the daily grind. My advice? Find a way to fold it in, but don’t make it the sole focus. Maybe two work sessions a week? Hope this helps! I love the way you implemented yours, and I think I will be tackling it next spring. (Not sure what my project would be though). My big question is more related to your red light-green light way of approving projects. Did you have any students in your classes who red-lighted a project simply because they didn’t like the student proposing the project or were in the middle of a personality conflict with them? I have seen a few issues this year with a few of my middle school boys who I would be worried would red light other people’s work just to mess with them. Did your students have to justify the reason why they rated someone a red, yellow, or green to prevent this type of bullying / wasted time? I have such small classes (12-13 in my middle school classes since we’re a private Catholic school) that getting just a few red or yellow light votes could derail what is otherwise a really good project and discourage my students. Any advice on handling this? Welcome to this side of the teacher’s desk! Hope you’ve enjoyed the roller coaster ride of this first year. Given what you’ve described, the GAEL project does seem to have some structural problems. I prefer tucking 20Time projects into our regular class meeting time and I encourage but never require out-of-class work time. Also, I like to limit the total project time to no more than 12 weeks. I’ve heard of full-year passion projects in some classrooms, but I’ve heard some of those tend to flop because the kids run out of steam. As for your question, I’m sure that an occasional kid has let a grudge influence his voting, but the red-, yellow-, and green-light voting always follows my opinion, too, so this isn’t something I’d worry about. Also, I have the kids vote anonymously on their ZipGrade forms and I never share the voting percentage results with the kids. I just tell them on the Friday after the Guppy Tank presentations which color ticket they received and then I quietly meet one-on-one during SSR with the yellow- and red-light kids to refine their project ideas. I think if I had a tiny class (not mentioning how completely JEALOUS I am of your set-up, by the way), I would have no problem overriding a vote and giving a green-light to a project that I knew would work, regardless of how immature middle school boys voted. They’ll never know, right? My name is Samal. I am an English teacher at Karaganda State Technical University and I started to do Boeing things. Your post cheered me up. Thank you. Thanks for sharing. After reading your posts on 20Time, I was eager to try it. So glad I did. I did it with my Pre-AP students. They loved it. We did have some problems remaining on task. Like you, I have a plan for accountability next year. What I did for updates and practice was to allow students to give a 3 minute speech and presentation on how they were coming along on their projects in their class. I allowed their classmates to give feedback. Their final presentations were set up in the library and I invited all of the ELAR teachers and a few of the 8th grade Science classes to bring their students. They presented during the two class periods I meet with them. Great feedback from teachers and students. First off, your blog and TPT store have totally saved me in my first two years of teaching. I’m at a new (tiny) school for my second year with 3 preps and no one who teaches the same classes as me, so I’m largely on my own (after coming from a large school with a very strong PLC structure and tons of colleague support). So you have been my pseudo-PLC this year and your materials, advice, and enthusiasm have very much helped to keep me going. So thanks so much for that. In the last few weeks, I’ve landed in a pretty bad rut. I don’t like how I’m teaching all that much, and I took on too much in terms of unit creation for all 3 preps at once, so I’ve been drowning a bit and losing sight of my goals for all of this teaching stuff. I recently implemented my own version of your SSR plan, and I’m ridiculously happy with this decision. Now I’ve turned my ever-ambitious eyes on 20Time (and I swear I’m coming for Quarter Trios at some point down the road…maybe that’s for year 3). I teach 10th (3 classes), 11th (2 classes), and 12th grade (1 class) ELA, and I’m trying to think about the best way to possibly incorporate 20Time for any or all of my classes. I have one small 1st hour class of 12th graders, and all of them are academically-minded, college-bound kids who seem willing to work with me. I’m thinking of having them be my test-group next quarter. My principal wants them to take an online course that ends with the CLEP Composition test at the end, and he would like the CLEP to be their midterm in December. I was thinking that between that, 20Time, and SSR, I could fill the remaining class time with building certain skills and have our second quarter/unit be focused around more independent work. Then I would have piloted 20Time with my classes, hopefully wrapped my head around it, and I could decide how I want to do it with my 10th/11th grade classes and sort out any kinks. Am I crazy? I feel a bit crazy. Maybe that’s a good thing. I’m really excited by this idea, and I desperately need that right now. I’m a bit scared by the amount of independent work and accountability this project encourages and requires. I have some real chuckleheads in some of my classes who get into the “I can’t do it” cycle and turn to disruption instead of asking for help. I certainly don’t want this project to push any kid into failing my class, and I want to make sure they’re actually doing what they should. We have a few school policies in place to help with that, and I’ve been reading your comments, but I was wondering if you had any other advice about how to make this work. Did you give a weekly grade for 20Time (like a participation grade for actually working or something like that) or was it just the pitch and the final speech you were grading? I’m terrified of it falling apart in my more challenging classes as students refuse to put real effort in from the beginning. I’m worried I won’t get the buy-in I’m looking for simply because it requires work or is related to school in some way. Or I’ll get the “I don’t have any ideas” kids who won’t choose a meaningful project. Sorry, I didn’t mean to write a novel for you to read here. I’m just really excited and terrified by the prospect of actually doing this, and if I’m going to go for it, I really want to GO FOR IT. Thanks so much for all you do. You’re definitely helping to prevent this English teacher from burning out. Hey, Victoria, you certainly have a significant prep load this year and I can relate to feeling a bit crazed in the face of all of these responsibilities. My advice is to use 20Time in this first year as a pilot with just one class, mostly likely that single section of seniors. Then, you can alter the assignment next summer to be the best fit for you, your kids, and campus culture. It would be a lot to launch this with all three preps in this year. Instead, I think Quarter Trios will be a more effective tool for your more challenging classes – those 10th grade sections, I suspect. Also, I’ve only ever used 20Time in the spring semester, once I know my kids well and know which of them will need more support/monitoring. The fall semester would be tough for me because I’m still building social capital with them and figuring out who they are and what they need. The spring semester is a more natural fit for this large load of independent work than the fall. 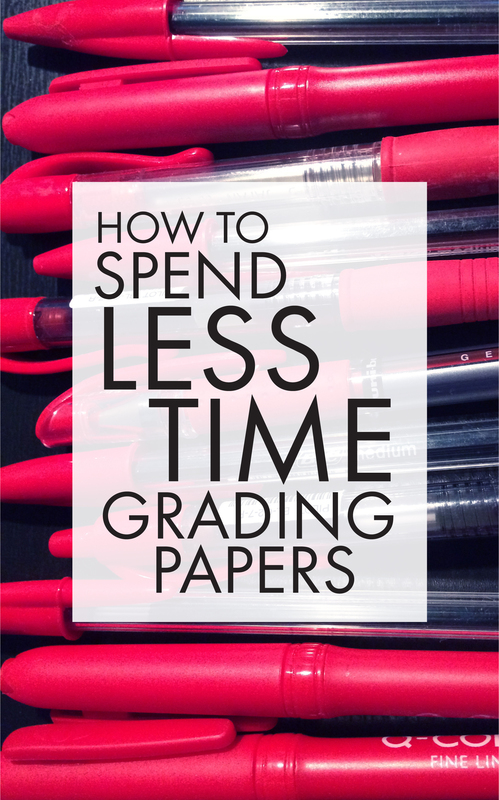 As for grading, there’s not a weekly grade because part of the point of 20Time is to work to follow a passion rather than to earn points for the grade book. Since I do need to have some sort of assessment of their work, I grade only the Guppy Tank proposal pitch and the end-of-unit “What I did/What I learned” speech. Everything else is monitored by me through casual one-on-one meetings and discussion, but no points are entered for that part. I am so excited to start this with my students next month! I am wondering if you ever decided on a format for your end of project “gallery.” Have you mastered that yet, or are you still working on a format for that? If you have mastered it, I’m curious as to what you did. As always, thank you so much for all your knowledge and materials! Love to hear this, Rebekah! Because all of my classes have ended up doing 20Time, a gallery event ended up being too large to manage, so I’ve just stuck with the TED-style reflective speeches that we hear during our class time in early May. If I were doing this with just one or two classes, I’d definitely do more to pursue that evening gallery idea, though. Definitely check back in later this semester and let me know how it’s going!